Imagine that the Next Big Earthquake finally hits California. Then the most violent El Niño in living memory rolls off the Pacific to hit the West Coast. Finally, Tupac Shakur returns from a secret hermitage in the Sierra Nevadas where he’s composed sixteen new albums. This is the approximate state of the book publishing industry today. Flux is a bit of an understatement. Amazon changes the rules of the game. Borders goes under and removes four hundred of the biggest brick-and-mortar bookstores in America. Ereaders take off and completely change what the word “book” means. Barnes and Noble is struggling to turn a profit just as independent bookstores are in the midst of a renaissance. The big New York publishers flounder while a new generation of indie writers storms the bestseller lists. It’s a crazy world out there for readers and writers right now. The rules of engagement between authors and traditional publishers are decades out of date. Trying to impress a system of gatekeepers offering onerous commercial terms that restrict creative freedom while offering little or support is not the kind of partnership I’ve ever been interested in. As an indie writer, my solution was obvious: self-publish. At least until a very special new publisher called Foundry Group Press (FG Press) sent me an email out of the blue. I had thought publishers were either evil or, at best, investing only in big names that would release guaranteed bestsellers. I was wrong. It turns out that just as indie writers are defining the cutting edge of storytelling, FG Press is setting the stage for the new frontiers of the book business. I’ll let you in on their secret sauce. Drum roll. Ready? Common sense. That’s it. They are setting up publishing agreements with authors that create a simple set of aligned incentives: 50/50 royalty split, no outdated advances, editorial/production support that cultivates writers instead of limiting them, launch strategies implemented by folks that understand Amazon algorithms, etc. They are encouraging their stable of authors to communicate, collaborate and learn from one another. They are actively incorporating the gritty wisdom on Kindleboards and online forums to recruit the cream of the crop cover designers, editors and team members to produce the best stories possible. Instead trying to turn themselves into a big name traditional publisher they are creating a launchpad to accelerate new voices, an incubator for indie writers, and source of awesome new stories for the most important people of all: readers. It’s been a roller coaster getting Uncommon Stock ready for release on March 5th (you can preorder it here). Various stages of editing, cover design, marketing kit, you name it. But it’s been a true blessing to have Dane, Brad and the FG Press team at my back. Writing can be a solitary endeavor but publishing is a group effort. I’m honored that Uncommon Stock is the lead title for FG Press. Can you imagine that? A publishing company launching the first book of an unknown author as its initial gambit? The guys in New York only make bets they know they can win. Where’s the fun in that? I probably shouldn’t be surprised. Brad’s famous for investing in new technology entrepreneurs with ambitions to change the world. 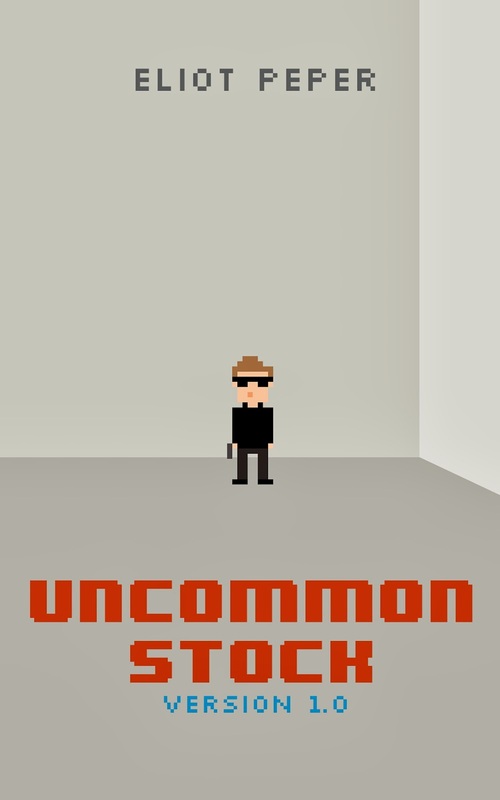 Uncommon Stock is a story about exactly those kind of people. I can’t wait to get it in front of readers and hear what you think. In the meantime, partnering with FG Press gives me more time to devote to writing my next book. It’s about 20% complete and I hope to have it in your hands later this year. Once the Earthquake runs its course and El Niño dies down, Tupac is going to need to find someone with cojones to get those sixteen new albums produced. He might want to ask FG Press for a referral. Oh, and you can pre-order Uncommon Stock here. It will release next Wednesday, March 5th and will be available on Amazon and other major retailers then. Hell, soon you'll be able to pay for it with bitcoin. Can't wait to hear what you think!